To many, pets are just like children. Owners feed them, care for them, and love them just as much as parents would do their kids, and they love us and provide comfort whether we need it or not. Because the relationship we have with our pets, particularly our dogs, is so important, these are the beings many hope to see before they die. One terminally ill mom’s wish was to see her dog for the last time, and the footage is both beautiful and heartbreaking. But it shows just how touching and unconditional this love can be. Rebane Chili was diagnosed with cancer, but after many treatments, she decided that it was time to stop them. She hadn’t seen her pup, Ritchie, during the months when she was in the hospital and made it her dying wish to be with him one last time. 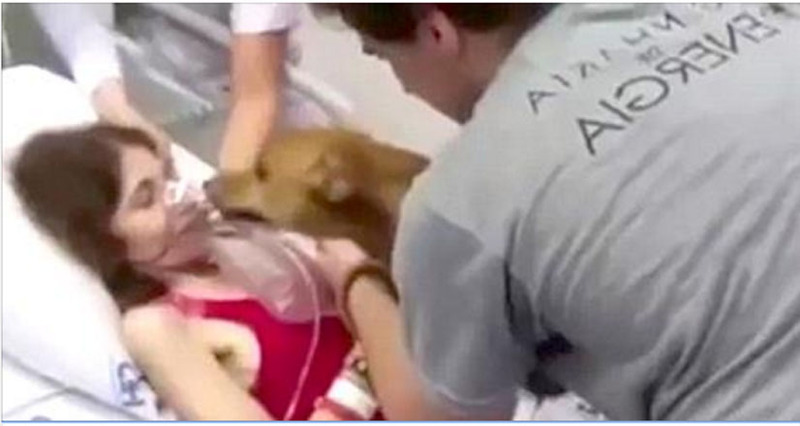 Chili’s son, James, brought the dog to the hospital, with the special permission of doctors. The mother was so excited for the reunion, she even changed her clothes and put on lipstick for the occasion. And when the pup was placed on her bed, everyone watching noticed a sudden change. Her mood seemed to change for the better, and she became more talkative and active, according to the psychologists present during the reunion. This proves that a dog’s love for his or her owner, though it may not cure cancer, has certain healing powers. Please SHARE if this emotional reunion made you want to hug your dog today!